Thanks to everyone for the first Bells on Danforth ride! 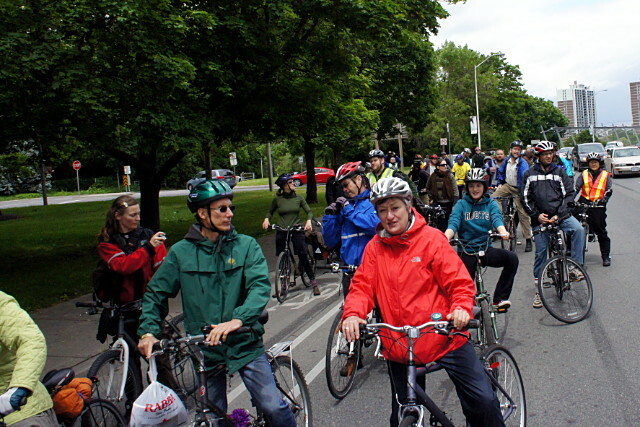 Thanks to more than 90 riders who came out for the inaugural Bells on Danforth ride on a chilly, windy Saturday afternoon on June 2 to celebrate cycling in Toronto and advocate for better infrastructure in the east end. Our first ride was a big success and we’re already looking forward to next year’s edition. Cycle Solutions for setting up in East Lynn Park and offering tune-ups and advice to riders. Broom Wagon Cyclery for providing a package of giveaways that was distributed among cyclists. We’d also like to thank the Toronto Police Service and Councillor Janet Davis (Ward 31, Beaches-East York) for joining us on the ride, Councillor Mary-Margaret McMahon (Ward 32, Beaches-East York) for providing behind-the-scenes support, and Albert Koehl for organizing the Cycle and Sole rally. The inaugural Bells on Danforth is a family-friendly group ride along the Danforth. 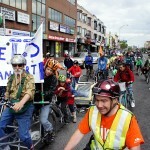 We’ll be leaving East Lynn Park (1 block west of Woodbine) and riding along Danforth and Bloor. We’ll meet the Bells on Bloor and Bells on Yonge group rides on our way to Queen’s Park to gather for the Cycle and Sole rally. Ring your bells and wave as we ride along Danforth to celebrate cycling and advocate for better cycling infrastructure. Join us in the park before the ride for socializing and cycling information. Cycle Solutions will have a tent in the park and will be offering light tuneups and bike advice. When: Saturday, June 2, 2012. Gather in the park starting at 1:00 p.m. The ride leaves the park at 2:00 p.m.
Leave a comment on this post or contact us at info@bellsondanforth.ca if you have any questions about the ride or want to volunteer to help. Bells on Danforth is a family-friendly bike ride along the Danforth and Bloor Street to Queen’s Park. The inaugural ride will be taking place on June 2, 2012. We’re still planning the details, so watch this space for more information. In the meantime, contact us if you have questions or want to volunteer.